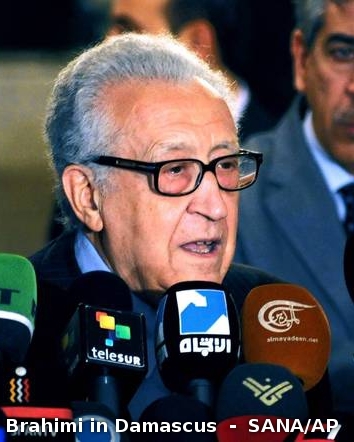 UN “peace envoy” Lakhdar Brahimi is attempting to broker a transitional government ahead of proposed elections in Syria. For Brahimi, his efforts are not only in vain, they are entirely disingenuous. The proposal of a “transitional government” in the midst of what is in fact a foreign invasion, funded, armed, and perpetuated openly by foreign interests violates both Syria’s sovereignty and the UN’s own founding charter. It would be not unlike a UN envoy visiting Poland at the beginning of World War II, and proposing a transitional government in the midst of the Nazi invasion. The UN would clearly be a facilitator of injustice, not a broker of peace. The UN has categorically failed to delineate between legitimate opposition inside of Syria, and bands of roving armed terrorists committing wide scale atrocities against the Syrian people – many of whom are not even from Syria, all of whom are heavily armed by the US, NATO, and its regional allies including Israel, Saudi Arabia, and Qatar as part of a long standing plan to effect regime change in both Syria and Iran. The Western press is not only supporting the UN’s disingenuous efforts, it has gone through great lengths to delegitimize any opposition in Syria that refuses to pick up arms, or that speaks out against foreign intervention. While the LA Times attempts to make the UN plan seem reasonable, with only Syrian President Bashar al-Assad and Russia standing in the way of peace, in reality, the plan is yet another effort to frame the conflict as a political struggle instead of the foreign invasion it actually is. The armed “rebels” the UN is refusing to condemn, constitute foreign Al Qaeda fighters, including the US State Department, United Nations, and the UK Home Office (page 5, .pdf)-listed international terrorist organization, the Libya Islamic Fighting Group (LIFG), Al Nusra also known as “Al Qaeda in Iraq,” and Syrian Muslim Brotherhood extremists. None of these terrorist factions would be negotiated with by Western nations if by some means their weapons turned from Syria and back toward the West. Yet the West demands that they not only be recognized and negotiated with, but indeed handed the entire nation of Syria to rule over. Syrian rebels held secret talks with Libya’s new authorities on Friday, aiming to secure weapons and money for their insurgency against President Bashar al-Assad’s regime, The Daily Telegraph has learned. At the meeting, which was held in Istanbul and included Turkish officials, the Syrians requested “assistance” from the Libyan representatives and were offered arms, and potentially volunteers. A volunteer Libyan fighter has also told CNN he intends to travel from Turkey to Syria within days to add a “platoon” of Libyan fighters to armed movement. In essence, Syria has been under invasion for nearly a year by Libyan terrorists. Additionally, in the immediate aftermath of the US recognizing its own handpicked “opposition coalition” as the “representatives of the Syrian people,” its leader, Moaz al-Khatib, immediately demanded that the US lift sanctions on Al Qaeda terrorist organization al-Nusra. Not only is the West refusing to acknowledge that Syria’s conflict is one of foreign and domestic terrorism, it is actively arming, funding, and offering safe haven to these terrorist factions. NATO-member Turkey is directly complicit in facilitating Libya’s extraterritorial aggression by hosting Libyan fighters within its borders, while coordinating their funding, arming, and logistics as they cross the Turkish-Syrian border. Along Turkey’s borders also facilitating Libya’s invasion of Syria, is America’s CIA. The New York Times admitted in June 2012 in their article, “C.I.A. Said to Aid in Steering Arms to Syrian Opposition,” that “CIA officers are operating secretly in southern Turkey,” and directing weapons including, “automatic rifles, rocket-propelled grenades, ammunition and some antitank weapons.” The NYT implicates Turkey, Saudi Arabia, and Qatar as the primary underwriters for the weapons while the CIA coordinates the logistics. Image: The “Friends of Syria” represent many of the co-conspirators described in Seymour Hersh’s extensive 9 page report “The Redirection.” Syria’s violence is not the result of an indigenous uprising carrying “political aspirations,” but rather the conspiring and machinations of the global elite, who long-ago premeditated the destruction of Syria for their own, larger, overarching geopolitical agenda. US policy versus Syria stretches as far back as 2007, where US officials admitted that they planned to overthrow the government of Syria with foreign-sectarian extremists, using nations like Saudi Arabia to channel funds and weapons through – specifically to maintain the illusion that they were somehow not involved. Al-Nusra are openly affiliates of Al Qaeda. To say that Libya’s LIFG are “sympathetic to Al Qaeda” would, however, be misleading. It is Al Qaeda. Hersh’s report would continue by stating, “the Saudi government, with Washington’s approval, would provide funds and logistical aid to weaken the government of President Bashir Assad, of Syria.” This included billions to pro-Saudi factions in Lebanon who were propping up militant groups linked to Al Qaeda. These militant groups are now crossing over the Lebanese-Syrian border to join their Libyan counterparts. Clearly the conspiracy being pieced together and executed in 2007, described by Seymour Hersh citing a myriad of US, Saudi, and Lebanese sources, is unfolding before our eyes. It was a conspiracy hatched of mutual US-Israeli-Saudi interests, not based on humanitarian concerns or “democracy,” but rather on toppling sovereign nations seen as a threat to their collective extraterritorial influence throughout the region. The UN’s failure to acknowledge a documented conspiracy by foreign interests to violently overthrow the government of Syria (and eventually Iran) once again exposes the international body as a tool for special interests. Its attempts to broker a “peace plan” between foreign terrorists invading Syria as proxies for Western powers, lacks any dimension of legitimacy. The Syrian government and its allies must redouble their efforts to frame the conflict as the invasion that it is – and call for both support and patience globally while Syria confronts and defeats these foreign invaders and the foreign interests arming and driving them. Lakhdar Brahimi, like Kofi Annan before him, is simply buying time for the West’s crumbling narrative. Syria and its allies must finally let it crumble, so the real business of saving Syria can get underway – through nation-wide anti-terrorism security operations, and the diplomatic confrontation of foreign interests supporting terrorism in and around Syria.